“Señoras y Señores, put your hands together for the fantastic, spectacular, one of a kind . 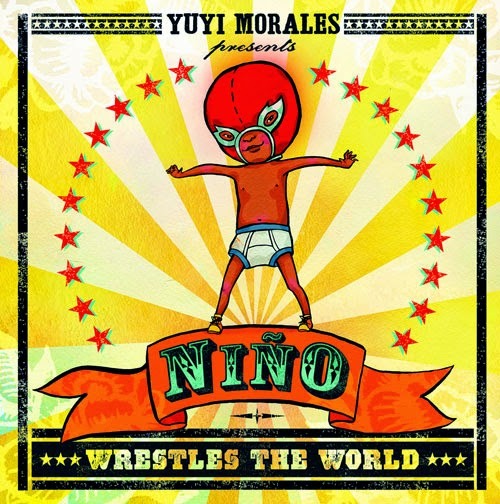 . . Niño!” These are the exciting opening lines of this month’s book selection, Niño Wrestles the World by award winning author/illustrator, Yuyi Morales. 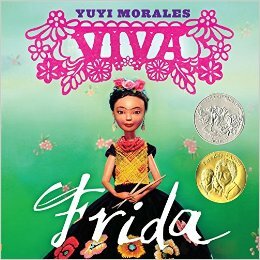 Bright vivacious colors, an adorable hero, eccentric characters, and elements of Mexican culture are featured in this lively story. This action-packed book is a wonderful celebration of open-ended play and sibling team work! 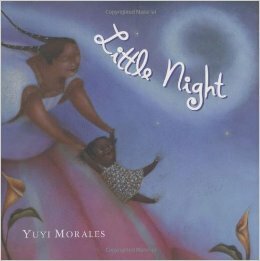 Activity 2: Some of the characters in this story might seem scary to children at first, such as “El Chamuco” and “La Llorona.” Lend your child a sympathetic ear and encourage your child talk about their fears. Activity: Have fun with your child singing a silly version of “The Wheels on the Bus.” Sing about the lucha characters from the story and their battle cries! El Niño on the bus shouts, “¡Ay, ay, ay ajúa!” All through the town! The Guanajuato Mummy moans, “Muarggg, whargg, argg!” All through the town! The Olmec Head on the bus goes, “Krunch crack-crack!” All through the town! La Llorona on the bus cries, “¡Ayyy mis hijos!” All through the town! Las Hermanitas on the bus go, “Cuchi cuchi-coo!” All through the town! Activity 1: This book provides rich vocabulary words, like: “superb,” “contenders,” and “dreadful.” Sharing this book and other books with your child is a superb way to introduce them to new or rare words! Activity 2: Take time to enjoy the extras! Luchador trading cards are displayed on the inside front and back cover of the book for each character in the story. 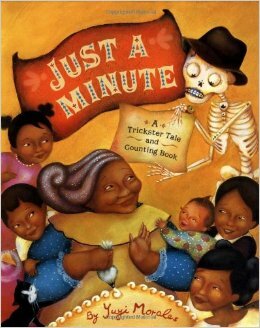 Read the descriptions with your child and practice saying their names. Need help with the Spanish pronunciations? Share the book with your child while watching a video of the author reading the book. After the video, practice saying the Spanish words together. Click here to watch the video. Studies show that imaginative play reinforces healthy social and emotional behavior, supports cognitive flexibility, and stimulates your child’s creativity! Activity 1: In Mexico, luchadores design their unique costumes to reflect their personalities. Get creative with your child and work together to design your own luchador masks! Click here to visit the author’s website for mask templates based on the illustrated luchadores in the story. Activity 2: Engage your child in imaginative play by retelling the story wearing your masks. Don’t forget to test out our favorite lucha style – the Tickle Tackle! Send a picture of you and your child wearing your luchador masks. Be creative! We can’t wait to see what you loved about Niño Wrestles the World.